University of Virginia graduate Dasha Tyshlek used the W.L. Lyons Brown III i.Lab at Darden School of Business to see whether being an entrepreneur was right for her. Her company, Sensibility Care, develops products to reduce complications and promote healing among orthopedic patients. The i.Lab provides funding, faculty and student support, office space, access to technological expertise and free legal services. The i.Lab, which falls under U.Va.’s Batten Institute for Entrepreneurship and Innovation, is just one example of how business schools are meeting the needs of the students and business owners. Schools today are putting more emphasis on innovation and experiential learning as well as adding new methods of instruction. Entrepreneurship is one of the hottest trends on business school campuses today. 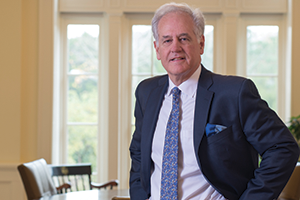 “The Jumpstart Our Business Startups [JOBS] Act [signed into law in 2012] makes it easier to offer equity crowdfunding,” says Larry Pulley, dean of the Raymond A. Mason School of Business at William & Mary, which has 550 undergraduate students and 630 graduate students. Courses in entrepreneurship and innovation are available at the graduate and undergraduate levels at George Mason University School of Business, says Dean Sarah Nutter, adding that the school’s Center for Innovation and Entrepreneurship “is available to all students and alumni.” The center serves as a central hub of entrepreneurship education and innovation activity at the university. The center’s Mason Innovation Lab, similar to the i.Lab concept, provides not only space to support teams of innovators and entrepreneurs in business model and product development but also mentoring by faculty and business experts. “Our students compete to get space in the lab,” says Nutter, whose school has 4,000 students, 3,500 of whom are undergraduates. Many students hoping to start businesses also are interested in making “a difference for the good in the world. They want to be part of the creative solution, both large and small,” says Pulley at William & Mary, noting that teams in the school’s Ukrop Innovation & Design Studio have a very strong not-for-profit focus. For example, teams in the “Sustainability Inspired Innovation and Design” class focus on applying design concepts toward solving problems involving sustainability. Next year, the Pamplin College of Business at Virginia Tech plans to open its Center for Global Business. It already is diversifying its student body. Business recruiters who visit the school want a “diverse population of students” for hiring purposes, says Candice Clemenz, Pamplin’s associate dean for undergraduate studies. Pamplin has 4,000 undergraduate students, 36 executive MBA students and more than 150 evening MBA students. In diversifying the student body, the school is recruiting more students classified as underrepresented in business programs, such low socio-economic and first-generation college students. Business schools and the business community interact in a variety of ways, often collaborating in “solving active business problems,” says Jeff Tanner, dean of Old Dominion University’s Strome College of Business, which has 3,200 students, including about 170 MBA students. “That is one thing that is unique to VCU,” says Dean Ed Grier. “When students finish, they are able to give good presentations. The unique thing about this course is that we partner with the Theater Department. Teachers in that department come in and teach, because an actor understands the audience.” The VCU business school has 4,000 students, 3,800 of whom are undergraduates. The school’s International Consulting Program gives undergraduate and graduate students the opportunity to work with local and international companies on the resolution of real business issues. Students have traveled to a variety of countries, including Greece, Spain and Morocco. “When they come back they are much more ready to take on bigger problems,” Grier says. Darden professors use the case method and simulations to immerse students in real-life situations, preparing them to become skilled decision-makers. University of Richmond Robins School of Business says it is dedicated to helping students with their professional development. “We help prepare students for interviews,” says Dean Nancy Bagranoff. “We help them think about what careers they want and help them improve their skills. We do this through competitions. Students love competitions. If you tell them they are going to compete on teams, they will spend hours preparing, and they will learn along the way.” UR has about 300 undergraduates and more than 30 MBA students. James Madison University’s College of Business is addressing the shifting role of management in society. “How do we get students to think about their roles as business professionals and leaders in terms of bringing profit and purpose together in a meaningful way, conscious capitalism?” says Dean Mary Gowan. The college, which has 4,885 undergraduate and 257 graduate students, is a leader in digital marketing instruction.